Side dishes perplex me. It’s like, create some food to compliment this main portion of your meal, but make sure it’s not too heavy or too light, and it absolutely can’t overpower the star of the dinner show (which is usually some sort of protein). Hello complicated. That’s why side dishes always seem to get the boot. Who wants to spend time on a SIDE? Well now you can, because cumin roasted carrots with maple lime tahini dressing is the perfect side dish to any meat, with very little effort. To prove how insanely easy this is, let me share a story. I whipped this up while trying to get my son to go down for his nap. If you are a mom, you know that nap time is CRUCIAL to mommy sanity. Seriously my eyes are big and serious as I type this. Crucial people. I laid him down with a few books and said, “Ok nigh nigh. Time to nap” and ran out of the room as if I lingered he may have some magical power to keep me from escaping. I headed down to the kitchen, threw a pound of carrots on a baking sheet, with a mixture of olive oil, salt, and cumin powder, then placed it into the oven at 375 degrees and set the timer for 40 minutes. Books have been chucked out of the crib and an angry muffled sound is coming from upstairs. I choose not to turn the sound on the monitor because it gives me anxiety. “He’ll go down. Breathe. He will totally tire out and go down…” I repeat this mantra to myself. But his angry sounds are getting louder. I find a small bowl and combine two tablespoons tahini paste, lime juice, maple syrup, and water. Mix it around until well combined. “MOOOOOOOOOMMMMMAAA!!! GRRRR!!! BAAAAH!” Even the dog looks concerned. So I head upstairs, apprehensively go in to his room and do those whole horse and pony show once again. “GO NIGHT NIGHT”. He’s happy, but sort testing me. I’m on to his game – he knows exactly how to get me, with those big brown eyes and curls. Especially when he grabs my face to bring it close to his. “Ok, I love you too. Time to sleep”. A few more rounds of this and before I know it, the timer on the oven is going off. 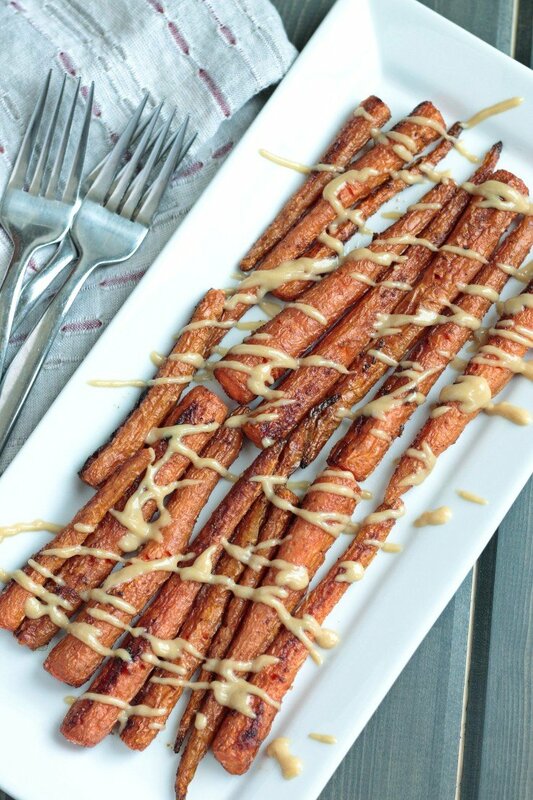 I take the roasted carrots off of the baking sheet and place them on a serving platter, then drizzle the maple lime tahini dressing all over those glorious roasted carrots. I think he’s finally starting to wear himself out. So I grab my camera and take a few shots to prove to all you wonderful friends that this dish is super easy, really tasty, and pretty! Moral of the story? If I can make an elegant side in between nap time struggles, you can do the same, in any circumstance. These cumin roasted carrots with maple lime tahini dressing are perfect for any season, any dish. That tahini is like frosting on the cake – sweet, slightly tart, and perfect with warmed, spiced carrots. Love tahini as much as I do? 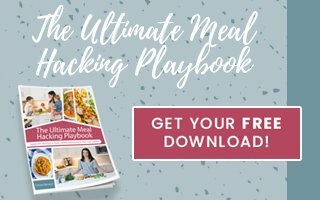 Try these recipes that include tahini: Lebanese Beef Zucchini Boats, No Bean Roasted Carrot Hummus, and a seasonal favorite, Soft and Chewy Paleo Gingerbread Cookies. Carrots are always a hit in our house, and I love that this is a creative and new way to use up that jar of tahini that’s been sitting in my refrigerator forever! I never know what to do with it (other than make hummus), but it’s SO good! Homemade hummus is the best! I also use tahini with maple syrup on my baked sweet potatoes. Definitely have to try that (and this recipe of course). Thanks Blair! omg I’m recently obsessed with Tahini!!! yesss! I’m putting this in to my weekly rotation for next week! Glad you got through the nap time struggles! Tahini is my thing. It’s totally my lovable ‘lil jar that holds a special place in my heart and my fridge. I hope you enjoy Heather! Bahaha! And roasted carrots are a classic! I am carrot crazy right now and well…I’m always tahini crazy, that’s a given! I’m totally tahini crazy too. I love it in baked goods and on veggies! That’s awesome. We are for sure friends because of this 😉 Thanks Casey! This is a different idea. I think I’ll be trying this out. Ooh wow, this looks absolutely delicious! 🙂 I love roasted carrots, but I’ve never put cumin on them before. Thanks Emily! Cumin is such a great, smoky spice to add to roasted root veggies! But I def need to try this dish for sure! This looks so yummy! I can’t wait to try this! Thanks Greta! I hope you love this side dish! Oh Cara you made my day! Thanks friend! Mmmm yes please!! Tahini + lemon = YUM! Thanks Liz!! Tahini is sooooo delish. Being a mom sounds sooo tough sometimes, hahaha. I don’t know how you do it! Wow this looks and sounds so yummy! Another one for the recipe list this weekend! Thanks so much Bree! Enjoy! 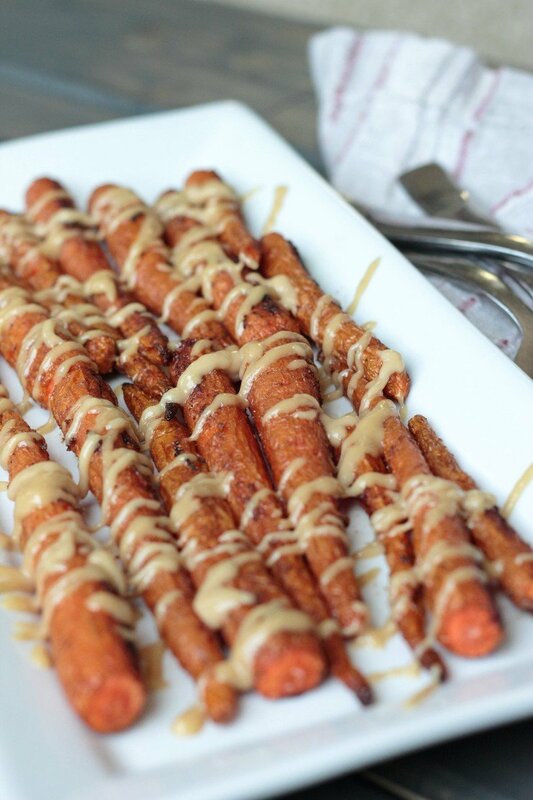 Love these carrots, I also drizzle mine with honey mustard sauce. Oh that sounds really yummy too Candy! Seriously so true! We are forced to be, right?! Thanks Anne! That looks so incredible delicious. I bet my husband and daughter would love that! I hope they do Jasmin! My 19-month old gobbled them up. Thanks! 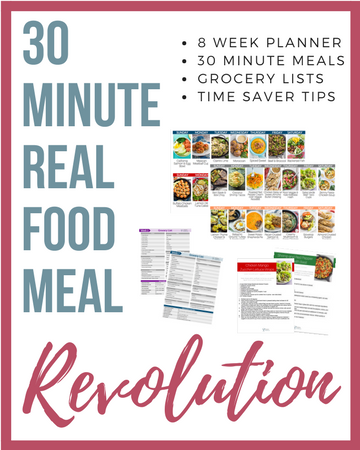 I love the idea of this recipe! I am currently living in an RV and I think I would modify the cooking of the carrots to bbqing instead of baking since we don’t really have an oven. It is really hard to find fresh vegetables in certain parts of the country as we travel around, but your can ALWAYS find carrots, this recipe will be awesome! I bet these would even taste BETTER grilled! But I LOVE grilled veggies – there’s just something about that yummy charred goodness! And you are so right, everyone has carrots. Good idea Andi! Firstly the first time I hear about it, and secondly for the first time I see this! And what I see is perfect! Pinned! You are so kind! Thanks Klauss! I can’t wait to try this recipe. I never in a million years would have put these ingredients together. This sounds delicious! All combinations i have never thought of before. Beautiful pictures too! These are son “good looking”, Ben stiller would be proud. Pinning. As usual! When I read “nigh nigh” I died laughing because that’s what I call it and my husband makes fun of me! I’m with ya – I often get lost on the sides. This one looks delish! Pinned! You are too funny. I love that you say it like that, and you don’t even have little ones (yet). You’ll be a pro at toddler-speak when you are a mommy! Thanks Carly! What an inspired recipe! I was smitten just reading the title. I really need to step up my dinner time game! Thank you so much Toni! The great thing is, stepping up your ‘game’ can be so easy! Appreciate your kind words! Oh my gosh those look absolutely incredible! 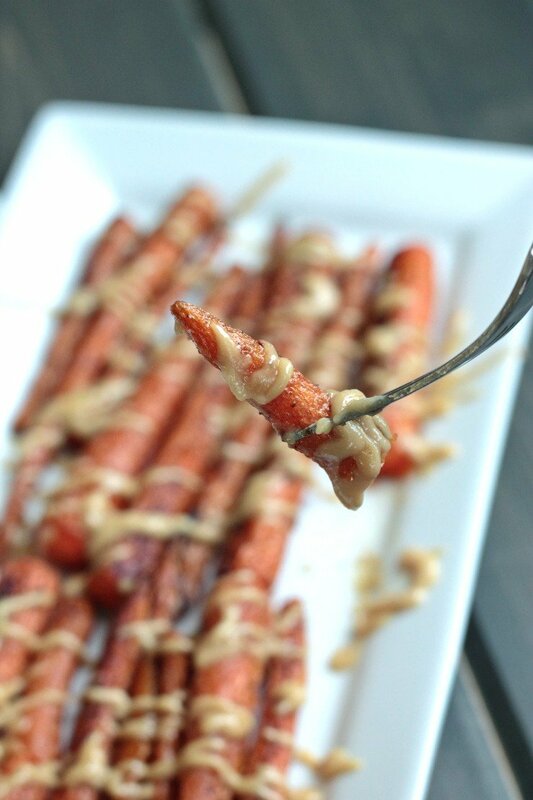 I love roasted carrots and I can only imagine how amazing these will taste! Thanks so much Courtney! They definitely are packed with a full bite of flavor! My husband is not a huge fan of carrots, but I bet this recipe would get him to eat them!! Thanks for the inspiration! SCORE! Anyone I can convert to liking more veggies is a WIN. Thanks Cathy! Oh man, nap time can be sooo great…when they sleep, lol. Love this, looks so yummy. I think my family will totally gobble this up. I’m always looking for different side dishes. Thanks for sharing!! Luckily mine DOES sleep. But I get spoiled with 3 hour naps so on that ‘off’ day he only goes down for an hour I’m so crabby. I SHOULD be thankful for any nap, right?! I hope your fam loves this Jenn. Sweet potato fries are the bomb!! As are these roasted carrots. Thanks Kristina! 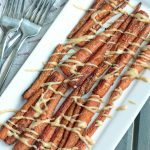 I make roasted carrots at least once a week, but I’ve never had them quite like this! This recipe sounds incredible, thanks for sharing it! You’re a roasted carrot PRO! I hope you love this version Chelsea! Your story made me laugh! Your son is adorable. Roasted carrots are my jam, especially when maple syrup is involved. Mmmmm roasted carrots and maple syrup is SOOOOO good together!! Yum! I’ve been looking for a new way to use my tahini. I always forget to make dressings with it! Dressings, baked goods, sweet maple drizzles…I’ve seen so many creative uses lately and I love it!